This website contains free programs and tools that are designed and developed either for personal use – the case in which you could also find them useful - or as a solution to some popular software needs/requirements. Do you like any program or tool on this website? If yes, then you can contribute to its development by translating it into other languages, reporting bugs or suggesting improvements. You can also share the information regarding its utility with your friends on social networks, boosting the software popularity. 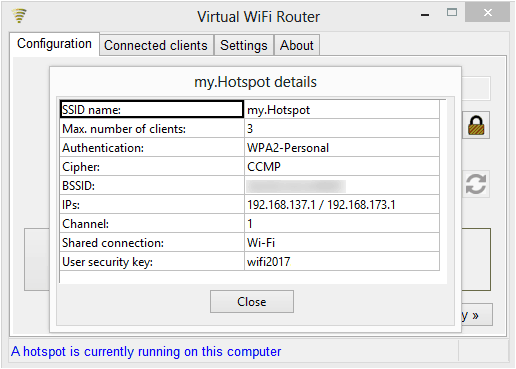 Create local WiFi networks or Internet hotspots by transforming your computer into a Wi-Fi router. 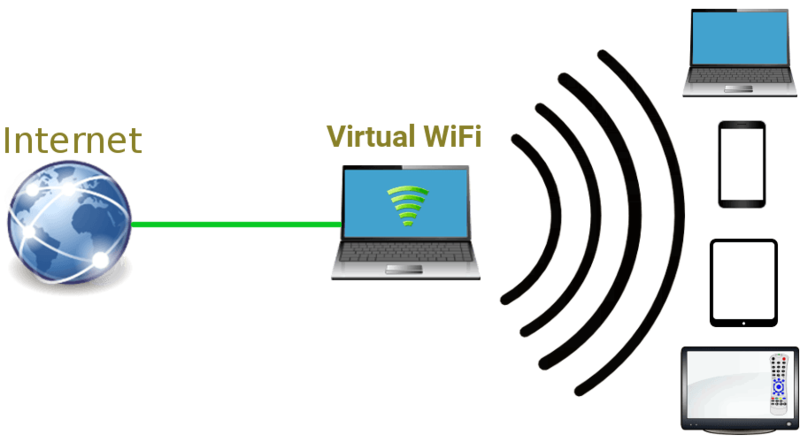 Using Virtual Wifi you can share your PC Internet connection with other Wi-Fi devices such as laptops, smartphones, tablets, smart TVs or to create local Wi-Fi networks that will support file transfer or resource sharing between the computers, respectively a mix between the two. Your application is very good. I love it, so I translated it into Vietnamese. I hope it will have Vietnamese. Thanks. 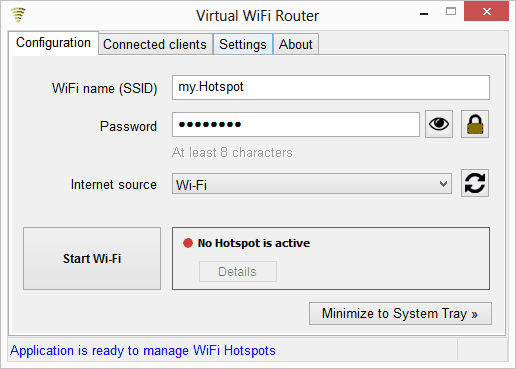 Available options: display a message, play a beep or .wav file, execute a program, script, or Command Prompt commands, restart, shutdown, and hibernate the computer, lock OS by showing the login screen (without user disconnection), sign out user, open a document or media file, and open web links in the browser. 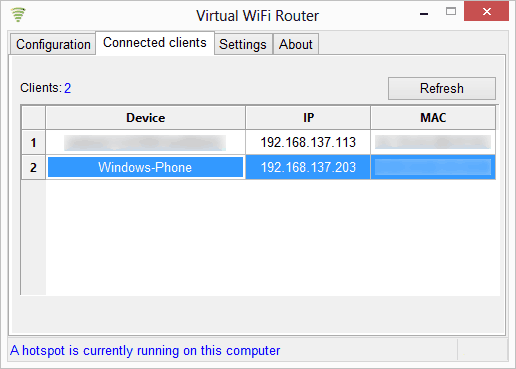 Convert your computer into a Virtual Wi-Fi router. 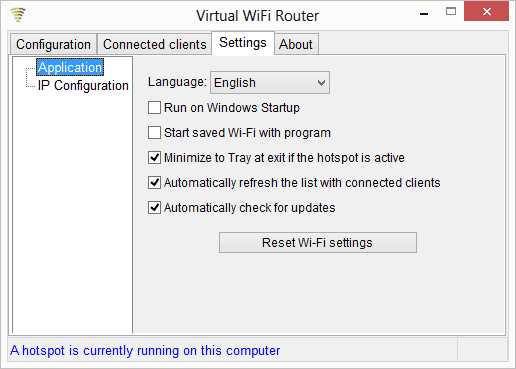 Using Virtual WiFi you can transform any computer which runs Windows 10, 8.1, 8, or 7 into a Wi-Fi router. The program is basic and easy to use, and it offers various useful features, many more to appear in the future. Supported languages: Romanian, English, French, Polish, Vietnamese. 2. 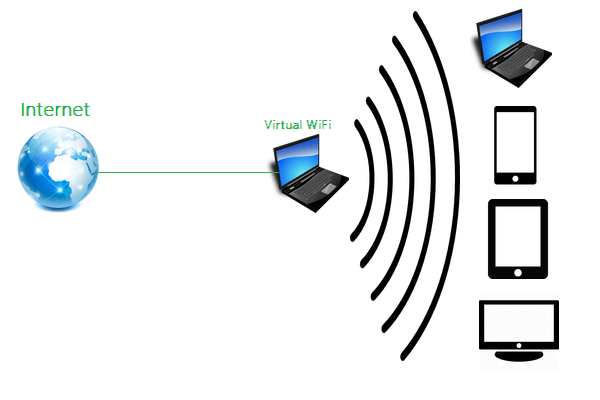 Internet Sharing Hotspots - for distributing PC’s available Internet connection (Ethernet, 3G/4G/5G modem, other Wi-Fi Access Point) among multiple Wi-Fi devices such as computers, tablets, smartphones, smart TVs. Compatibility: Windows 10, 8.1, 8, 7. - Open a document or media file, open web links in the browser. Improvements include better interface design, faster detection of the connected/disconnected clients, the capability to minimize to tray and generate a strong password. It will be compatible with the major Windows versions and serve as a perfect solution for setting multiple timers and alarms on your PC. Also, you will be able to trigger actions (run a program or command, shutdown the computer, display a message, etc.) at any chosen moment.